Bright, bold and trendy, with an idyllic beachfront location and Sea Views, ibis Samui Bophut has it all. Modern rooms, each include complimentary WiFi, tea, coffee & water and balcony terrace. 24 hour reception, Food & Drink around-the-clock. 15 minutes walk from charming Fisherman Village and 15 minutes shuttle ride to Chaweng Beach. 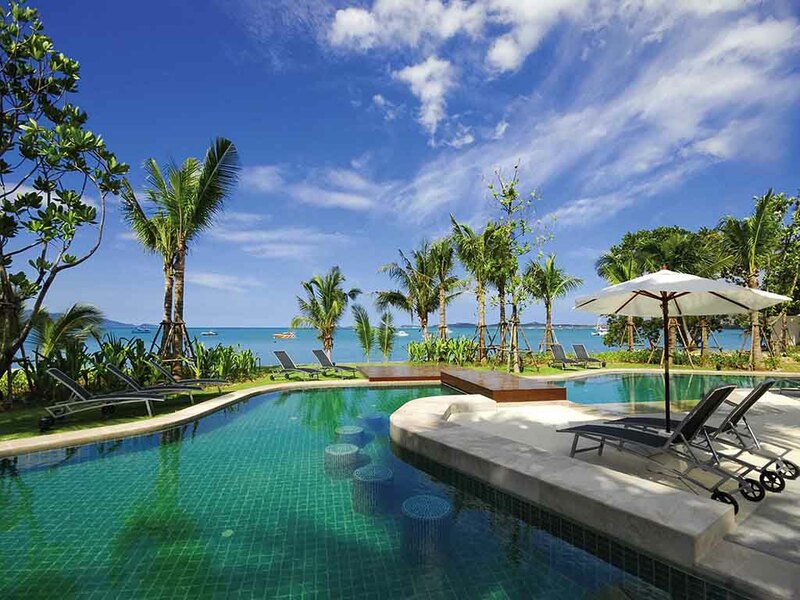 Relax by the pool, chill out at the bar or explore Bophut bay by kayak. The only international 3 star hotel in Bophut, our hotel is a refreshing island paradise. Ibis Samui Bophut is part of the exclusive MyResorts program that provides rewarding resort experiences for Le Club AccorHotels members. Guests are close to The Wharf beachfront shopping plaza, the authentic Fisherman's Village, and the beautiful Big Buddha. Chawaeng Beach with dining, nightlife and markets is also just 15 minutes away. Boats trips can be taken from the nearby pier. Dear Ms. Tara A., We are delighted to hear that you enjoyed your stay at Ibis Samui Bophut, and appreciated the comfort of our Family room. Thank you very much for choosing us for your holiday in Samui! Please receive our best regards from all the team, Laura D.
Great hotel. Friendly staff and nice clean rooms. Dear Mr. B., Thank you for your nice comments regarding your stay here! We are glad to know that you appreciated your holiday at ibis Samui, the quality of our services as well as our friendly team. Thank you again for sharing your positive experience, and would be a pleasure for us to welcome you back! Kind regards, Laura D.
The accommodation and grounds are stunning. The location is excellent. The staff are super friendly and very helpful and also very accommodating to special needs. For example, my group had a Granny who has knee problems and they allowed her to use the staff elevator. The pool area is amazing. Everything is very clean and well kept. The buffet breakfast has a great variety, including fresh juice and very good coffee. I love that the aircon in the room stays on all the time. The only complaints I have is that it would have been nice to have bacon at breakfast. Also, I ordered the ham and cheese sandwich (with the fancy name I can’t remember) from the poolside bar and it was awesome except that the bread was stale. Dear Ms. Emma, Your comments are a real enjoyment for us, thank you very much for giving your feedback. I will be happy to share it with the team, especially your kind remark about our friendly and helpful staff which will serve as an encouragement for them. We would be all delighted to welcome you back in the near future! Thank you again for your trust. Warm regards from ibis Samui, Laura D.
Dear Ms. Kamielah B., We very much appreciate your kind compliments, it is a pleasure to know that you had a pleasant stay at ibis Samui Bophut! As our valued guest, your opinion is important for us and we thank you for sharing it. Hoping to hear from you in the near future, please receive our best regards. Laura D.
My room has no soap because containner was leak then call to operator and they ask me too go back to find it again. After housekeeping ask me what do i need then come to check in the bathroom and say ok no soap. They come back to change new soap with spead it all the way from bath to door room and i have to ask them to clean it then they come back with dry floor towel then make room floor viscous again i have to tell them to find wet towel to clean it all process take more than 30min and im on my towel. Dear Mr. Naruepon S., Thank you for taking time to share your comments regarding your stay at Ibis Samui hotel. Firstly I would like to apologize for any inconvenience caused during your stay. As we strive to provide a great comfort to our guests, our team is constantly trying to do the best for them, as efficiently as possible. Rest assured that your remarks have been noted and will be seriously taken in consideration. Again, thank you for choosing ibis Samui Bophut as your domicile for your stay on the island and for taking the time to leave a comment. Please accept our best regards, Laura D.
Dear Ms. Sarah b., We are so delighted to receive your positive comments! Thank you very much for choosing Ibis Samui and for sharing your feelings with us. It is our hope that you keep good memories of your holiday in Samui, and that we could welcome you back in the future! With our best regards, Laura D.
A great place to stay. Rooms were comfy, staff friendly and amenities great. Bed was a tad hard but the only downside. Dear Mr. S., Thank you very much for giving us such positive review! We are delighted to read that you appreciated the comfort of our rooms and the hotel amenities. I will be happy to share your comments with our friendly staff, as you kindly mentioned. Hopefully we could welcome you back here soon! With warm regards, Laura D.
Dear guest, Thank you for taking the time to tell us about your experience at ibis Samui Bophut, and for mentioning our beautiful garden. We are sorry that your experience did not meet your expectations, please accept our sincerest apologies. At Ibis, we strive to provide a superior service experience at the most accessible price, therefore your feedback is very important to us. During the current year, we are working on implementing changes in order to enhance these areas, and in this way ensure enjoyable experience to every guest. We value our guests opinions and would like to thank you for bringing this to our attention. Please accept our best regards, Laura D.
Rooms were a little small. Staff were great. Have more than one person making the omelettes at breakfast or have the person using 2 pans at once. They would only do one at a time and so there was a very long wait. Dear guest, Thank you for staying at Ibis Samui Bophut! And thank you very much for mentioning our friendly staff. We also noted your comments as we strive to offer a great service for our customers. Thank you again for taking time to share your experience! Best regards, Laura D.
Dear guest, Thank you for taking time to tell us about your experience at Ibis Samui hotel. I am delighted to read that you appreciated our friendly staff and the pool area. As we strive to provide a great service experience for every customer, your feedback is very important to us and we are sad to hear that you felt dissatisfaction regarding some points. From all the team, please accept our best regards and we hope you keep pleasant memories of sunny Samui! Thank you again, Laura D.
Room upgrade was nice .Very disappointed with sunbed situation, not enough and people putting towels on them all day every day ,even with notice of towels will be removed sign ,which was never executed !! Could never get a sunbed ! Breakfast was hit and miss too ! Shuttle Ok .
Dear guest, Thank you for taking time to share your experience at ibis Samui, we are happy to read that you appreciated the room. Please accept our apologies for the disappointment regarding the sunbed situation. We aim to provide the greatest comfort to our guests and are currently planning on setting additional seating places around the pool area. Thank you again for your feedback, we hope that you keep pleasant memories of your stay with us! Sincerely, Laura D.
Dear Tanachai O., We would like to thank you for your kind comments about your experience with us! It is a pleasure to read that you enjoyed the peaceful environment of our resort. Thank you for choosing us for your stay in Samui! Warm regards from all the team, Laura D.
Was much better than I anticipated, the staff are a credit to you. I love Thai people so humble and polite. Dear Mrs. A., We would like to thank you for sharing your experience with us in Samui, and most of all, for highlighting the personal qualities of our staff. I will be very happy to share your warm compliments with them! With our best regards, Laura D.
In most cases my wife and I were extremely satisfied - the location is great, right on the beach and is not far from the airport, staff are genuinely friendly and helpful but we had a couple of minor issues - we had to ask housekeeping to replace our bedsheet owing to a large visible stain, we had to wait over 30 minutes for a pizza so were forced to cancel our order and meal and perhaps more a facilities management issue than service; two of the stall doors in the men's washroom on the ground floor would not close and lock and a rubber seal from one of our hotel room bathroom's was missing thus making the floor rather wet during use. That said, staff were helpful and assisted us with arrangements that had no direct connection to the hotel and during one evening where we had dinner at the hotel, the food quality was good with healthy sized portions. We were also upgraded to a family room upon arrival which was a nice touch - so we had a couple of issues (nothing is perfect) but we enjoyed ourselves and will definitely revisit the property and are happy to recommend it to others. Dear Mr. T., We very much appreciate your comments regarding your stay at the ibis Samui Bophut! We are happy to read that you had a pleasant experience with us in Samui. Thank you for highlighting and giving a constructive feedback that can help us into improving our service, I have immediately shared your remarks with the team in order to take the necessary measures. We would also like to thank you for mentioning our reliable and helpful staff, as well as the food quality of our restaurant. It is a pleasure to read that you finally enjoyed your holiday and we are very grateful for the recommendation. We look forward to welcome you back! Kind regards, Laura D.
Room very basic not enough storage space. Cupboard very small no drawers at all. No side table. Location good. Dear guest, Thank you for choosing the ibis Samui for your stay here, and thank you for taking time to share your experience! We value feedback from all our guests and take great care to continuously improve the quality of our services. We hope you enjoyed your stay in Samui! Thank you again for your trust. Sincerely, Laura D.
Overall is good, fair price, service is good, room well maintenance but bath room wet & dry area are combine which have some floor partition will be goood. And last one check out area is quite dark in the night time. Dear guest, Thank you for your positive feedback! We are happy to hear that you had a pleasant stay with us and you appreciated our hotel facilities. We value our guests opinion as we focus on delivering a consistently good service to them. Then, we thank you again for taking time to share your experience and for trusting us! Warm regards, Laura D.
Dear Samo, We would like to thank you for these kind comments about your stay with us! We are delighted to read that you appreciated the kindness of our staff and the hotel comfort. We look forward to welcoming you back to Samui in the near future! Warm regards, Laura D.
Very nice stay, staff very friendly and helpful, great location, lovely beach. lovely hotel in a good location. Staff were very friendly and having good spoken English was very much appreciated. Having the room cleaned, or at least beds made every day was lovely. I did feel a bit cheated in the 2 for 1 cocktails happy hour as I noticed i had more ice in my drink during happy hour and less any other time. Food selection was good and overall quality was good too. In Bophut for a family wedding this was a great hotel for us all and we would definitely come back. We stayed at the Ibis for four nights. The hotel was in a good location for Bophut Beach and Fishermans village night market and a short taxi ride to Big Buddha. The rooms were clean and tidy and well presented. The buffet breakfast was good value for money and catered for all tastes. The pools were clean and the hotel backed onto the beach. The only downside was our room was right above the restaurant so we could hear the chairs scraping across the floor from as early as 5:30am!! Had I not been a light sleeper this would not have been a problem. Dear Joy, We very much appreciate your kind comments regarding your stay at the ibis Samui Bophut. We are delighted to read that you enjoyed the comfort and location of our hotel, as well as the buffet breakfast from our restaurant. I will be pleased to share your positive feedback with the team! Concerning the discomfort with the noise, we sincerely apologize for it and hope that it didn't impact your enjoyable holiday. Thank your for your time and for your trust! Warm regards, Laura D.